Blizzard doesn't sit still, and neither a recently updated beta build has brought out some new profession stuff to expand the known list. Blacksmithing in special seems to have gotten a rather out of proportions buff compared to most professions. But, keep in mind that there's still a lot of things being added all the time. Other professions are likely to still be expanded to don't go around re-rolling all your professions just because of a single beta update. Herbalism gets a self heal. Four new leg enchant patterns for tailoring as well as a BoP cloak enchant. Blacksmiths to add sockets to belt, bracers and gloves. Engineers get a cloak, belt, boot and glove enchant. Meta gems listed on MMOC. Not bind on pickup, but still interesting. More glyphs for Paladins, shamans and priests. Also the interface was changed. Source. SK gaming. And WoR. Gloves: Hyperspeed Accelerators - Permanently attaches hyperspeed accelerators to a pair of gloves, allowing a skilled engineer to increase their haste rating by 340 for 8 sec. Boots: Nitro Boosts - Permanently attaches overpowered nitro boosts to a pair of boots, allowing a skilled engineer to greatly increase run speed for 8 sec. Cloak: Flexweave Underlay - Permanently attaches a flexweave underlay to a cloak, allowing a skilled engineer to turn the cloak into a parachute to fall slowly for 10 sec. Belt: Personal Electromagnetic Pulse Generator - Permanently attaches a high-powered device to your belt, allowing you to stun nearby mechanicals. Belt: Belt-Clipped Spynoculars - Permanently attaches a pair of spynoculars to your belt, allowing you to see far away. Scopes: +40 hit rating, +40 crit rating. Seems my +30 hit rating scope from Molten Core is finally useless. Other engineering stuff includes a scrapbot and apparently the portable mailbox and auction house bot are also being added again. For some more info see WotLK Wiki. No details on any BoP leg enchants for tailors yet unlike leatherworking, but that doesn't mean they won't be added at all. The 3 new cloak enchants appear to be useable by the tailor only. Shining Spellthread - Increasing spell power by 35 and Spirit by 12. Brilliant Spellthread - Increasing spell power by 50 and Spirit by 20. Azure Spellthread - Increasing spell power by 35 and Stamina by 20. Sapphire Spellthread - Increasing spell power by 50 and Stamina by 30. Embroiders a subtle pattern of light into your cloak, giving you a chance to cause an additional 800 to 1000 Holy damage when you damage an enemy with a spell. You can only embroider your own cloak and embroidering your cloak will cause it to become soulbound. Embroiders a magical pattern into your cloak, giving you a chance to restore 300 mana when you cast a spell. You can only embroider your own cloak and embroidering your cloak will cause it to become soulbound. Embroiders a magical pattern into your cloak, causing your damaging melee attacks to sometimes ignore 1000 of your target's armor. You can only embroider your own cloak and embroidering your cloak will cause it to become soulbound. Herbalism get's a small self heal which should be a great boon for any arena players as well as anyone unable to heal themselves while grinding. E.g. rogues, warriors, mages. The skill heals more depending on the rank of your herbalism skill. Blacksmithing seems the most overpowered update. Two extra sockets on top of the two weapon sockets makes a total of 4 sockets, 4x20 stats = 80 stats. That's HUGE! According to this poster they are blacksmith only. Time will tell if it's a reliable source. The sockets are "colorless" and can be added to any item even if it already has sockets. The sockets do not award any bonus such as 3 stamina. Bracer: Permanently add a socket to your bracers. Requires a level 60 or higher item. Gloves: Permanently add a socket to your gloves. Requires a level 60 or higher item. 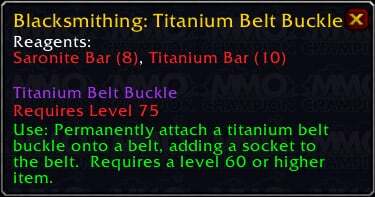 Belt: Titanium Belt Buckle, adds 1 socket to a belt. Seems to be a tradeable item. Weaponsmiths can add sockets to weapons. Armorsmiths can add sockets to the two mentioned armor slots. Belt socket still believed to be tradeable. Seems blacksmithing will still be balanced around 2x20 stats like the other professions. 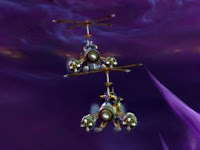 ps: Tailoring gets a "tailor only" flying carpet mount! You mentioned: "Two extra sockets on top of the two weapon sockets makes a total of 4 sockets ...". That's not correct afaik. There is no sign in Beta that Blacksmiths are able to add other sockets than Bracers and Boots and the tradable belt-socket. So Blacksmiths DO get two sockets and great weapons, but not 4 sockets. Hmm, there was a spell that mentioned a socket option into a weapon iirc. Unless that got removed, and the bracer and glove sockets are the smith only thing, where the belt thins is tradeable. Finally, a benefit from Blacksmithing that my perky priestess can benefit from! Let's see my raid make fun of me for having a hammersmith Holy priest now! * Weapon smiths can add sockets to weapons. * Armor smiths can add sockets to the 2 mentioned armor pieces. Sitting still is what Blizzard does best. Other than a little more of the same for the last 3+ years, what has Blizzard done? Nothing. More raid dungeons. More slightly incremented loot. That's it. No alternate forms of gameplay besides raiding. They sit still like a shut in.